This paper investigates an optimization for the axisymmetric hub-endwall profile of a transonic fan designed for a civil high bypass ratio turbofan engine. 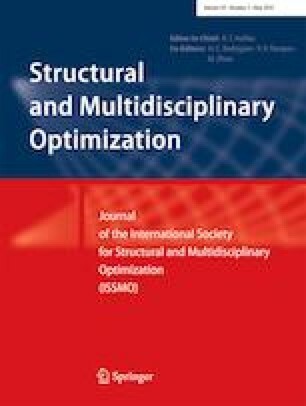 A time-saving integrated design optimization method is proposed based on a new hub-endwall profile modification method in combination with a novel two-stage polynomial response surface. The profile modification method is proposed to change the profile of the baseline hub curve by moving three control points, so as to redesign the hub-endwall. The two-stage polynomial response surface is proposed to obtain an accurate high-order polynomial while requiring fewer sampling points, so as to reduce the computational cost. The results show that the integrated design optimization method is suitable and valuable. After optimization, the corner separation of the studied fan is weakened, and the stall margin of the core fan is also enlarged. Moreover, the aerodynamic performance of the core fan at the design speed is improved. The online version of this article ( https://doi.org/10.1007/s00158-019-02266-y) contains supplementary material, which is available to authorized users. For the convenience of other researchers, the involved codes of the proposed two-stage polynomial response surface are included in the supplementary online material.